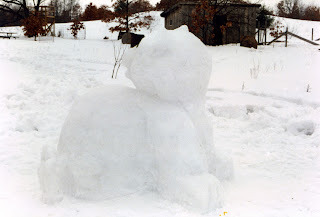 When I was a kid, we made a giant snow bear based on a figurine. This inspired me to want to make snow creatures with the kids. 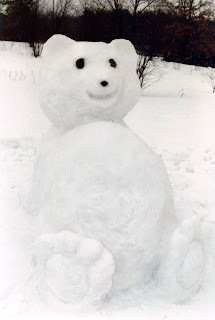 It was hard to see the snow creatures in the pictures, so I had to darken the pictures and that wasn't so great for seeing the kids! So I copied the kid in the picture, darkened the picture, and then pasted the non-darkened part with the kid in it! I'm excited to give the ideas presented in the book a try! This book is good for absolute beginners as well as those (like me) who've done some seed starting before with limited success. 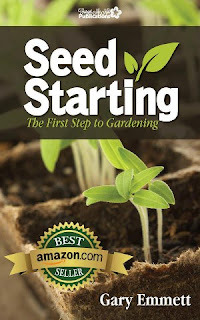 "Seed Starting" is available on Amazon as a Kindle ebook (I used the Kindle for PC app) for $2.99. I was provided a free copy of this book for my honest review. I did not receive any other compensation for this review. I guess that means I should get started on sewing Easter clothes! Life always has a way of sneeking up on you when you're busy doing something else! I have been blogging since June 2007, but never thought of using a blogging planner. I'm not even sure I'd ever heard of them before! The review group that I belong to assigned us the task of reviewing a blogging planner. I choose MamaJenn's Blogging Planner, which is a free download. I printed all the odd pages first, but then because I was afraid that if I just stuck the whole stack back in and printed the even sides, it'd mess up the order and that I'd run out of ink before I even got January printed, I decided to print the even sides manually. I grabbed the first page I'd printed and printed the next page on the back. I printed January that way and decided that I would like it better if the "Blog Post Notes" page showed the same time as the "Giveaways/ Reviews" page. So, I altered what order I was feeding the pages through when printing the even sides. I went on my merry way printing with my "improved" order through May when I made another discovery....The "Monthly Blog Planning" page was visible at the same time as the "Monthly Blog Calendar" page for the next month! I looked at MamaJenn's blog and realized that those two pages for the SAME month were supposed to be together! I printed an extra "Notes" page on the back of June's "Monthly Blog Calendar" and then everything else fell into the right order! At least the last half of the year will be the way it's supposed to be! I tend to have tons of blog post ideas and never get around to actually blogging about them, or I forget to do it. The "Monthly Blog Calendar" is great to help me keep on track and the "Monthly Blog Planning" page helps me to plan out what I want to blog about. I usually just come up with the content for my blog posts as I write them, but with the "Blog Post Notes" page, I can plan out what I'm going to say ahead of time and save time once I'm at the computer. The "Giveaways/Reviews" page is wonderful for keeping track of my thoughts about a product while using it so I can remember them when it comes time to write the review! It gives you a place to keep track of when the review is due, which is helpful to me so I don't forget to post it! I found that I needed more room for my notes on a product, so I printed an extra page of "Giveaways/Reviews" with an extra page of "Blog Post Notes" on the back to make sure I had plenty of room for my thoughts. Each month's page has the same color flower. It helps you know that you are on the right month and I liked the little pop of color on each page. In the back of the planner, there are pages for "Future Blog Post Ideas", "Notes", "Year at a Glance", and "Monthly Blog Statistics". I have quite a few ideas already in the "Future Blog Post Ideas" and I like being able to track how many followers and page views I'm getting. This is my honest opinion and I didn't receive anything in exchange for this review. Our church's annual free kids carnival was Wednesday. This year's theme was "Cosmic Quest". So we all dressed up in "space" suits (except Emi who really wanted to wear the "Wolverine" costume!) My sister brought her working full sized R2D2. Sarah already has plans for next year for how she will be able to not miss any of the games. Which prize do I want? ?